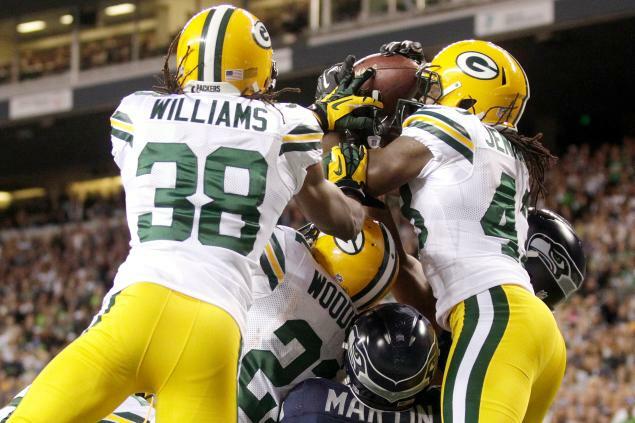 Anyone else as speechless as Aaron Rodgers about the final play of the Packers-Seahawks game last night? His description after a moment of hesitation, “It was awful.” This was followed by a shoulder-shrug and a look of frustration and being overall disgusted. The final play of the game is a difficult one to try to describe without you just watching it. Basically, the Seahawks had possession, threw a Hail Mary to the end zone, and it was intercepted by MD Jennings. Before the catch was even made, there was a horrendous Offensive Pass Interference that was completely ignored. Making that call would have prevented the interception/touchdown call drama but obviously they are terrible refs so what can we expect? What the referees saw was something COMPLETELY different and somehow called it a touchdown. That has to be the first time ever that a quarterback has thrown an interception to WIN a game. How is this not an interception? I think it is about time the regular officials end this thing and get back to their jobs because clearly it is not a job that everyone can do. However, that call did not appear to be a difficult one for anyone who was actually watching the game. The fact that they reviewed it and still came up with the same conclusion is what baffles me. If you missed this play, you can watch it along with other highlights of the game here. I think 90% of people on Facebook had a status that was related to this call or the entire game in general. The replacement refs may be the most hated group in America right now. I personally could care less about either of these teams and that play frustrated me. They are making it to where no one is going to take this season or the NFL seriously. Luckily I am not a die-hard fan so I got a good chuckle out of it. Last Friday marked the last day of summer for 2012…anyone around here actually feel like it’s fall yet? Because I sure don’t. The temperature is still in the 90s mid day but I guess the cool morning temperatures in the high 70s is the best we can hope for right now. I thought there was supposed to be a cold front come through..what happened to that?? As I was pulling into the parking lot at work this morning, I had a great idea. In fact, this idea is so great that I think the majority of us have already thought that we needed it. I was listening to a segment on the radio when I parked my truck and needed to go inside. That’s when I had my internal battle on whether I should wait in my truck to listen to the remainder of the segment or go into work on time. I shouldn’t have to have this battle with myself! Why is there not a version of DVR for the radio?! If there is and I am just behind in my technology knowledge (wouldn’t be surprising) then would someone please let me know? If such a thing doesn’t exist yet, some smart person invent it and give me credit. Kthanks. 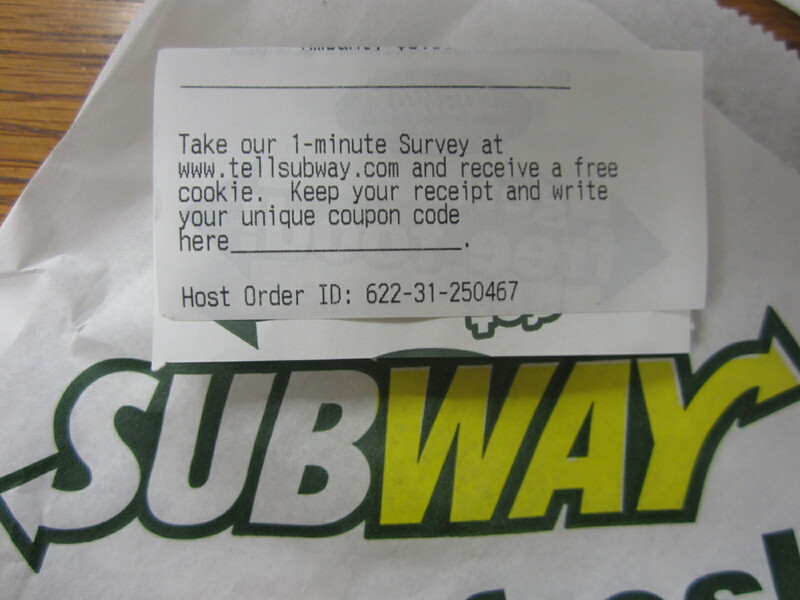 Did you know that every receipt from Subway has an offer for a free cookie? Promise. Either that or I get lucky with one on my receipts 100% of the time. 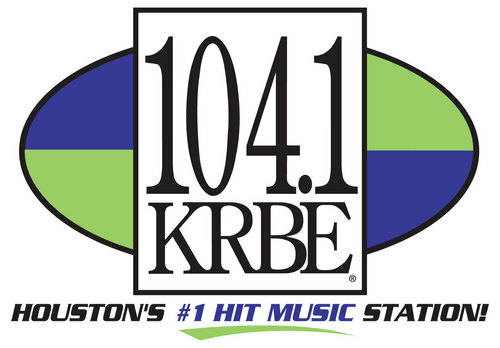 All you have to do is go to the website listed and fill out the 1-minute survey. It literally is that fast. Shortest survey ever, especially for something free! I haven’t paid for a cookie from Subway in years!